Your pacemaker is a lifesaving device, so it’s important to understand exactly how it works. Using customized electrical pulses, a pacemaker is able to maintain a normal heartbeat to prevent arrhythmias and keep you healthy. If you are vulnerable to abnormal heartbeats, pacemaker can help you live a more active and fulfilling life without the constant risks of fatigue, fainting, and loss of consciousness. Your heart beats and keeps you alive thanks to its own internal electrical system. Electrical signals spread all around your heart with each heartbeat. As those signals spread, they cause your heart to contract and pump blood. However, when the electrical signaling within your heart becomes faulty, you begin to suffer from arrhythmias. Arrhythmias are abnormalities with the rate or rhythm of your heartbeat. Your arrhythmias might cause your heart to beat too slow, too fast, or in an irregular pattern. Without beating consistently, your heart cannot continually pump enough blood throughout your body. This leads to dangerous symptoms like fatigue, shortness of breath, and fainting. Severe arrhythmias are even capable of causing death. Your arrhythmias will not correct themselves. You need to seek professional care from a cardiologist in order to normalize your heartbeat function. Once a pacemaker is placed in your chest, it will balance the electrical system that controls your heartbeats. This means it can speed up a slow heart rhythm, control a fast or abnormal heartbeat, and make sure all ventricles contract normally. 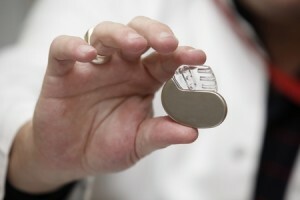 Newer pacemakers even have advanced technologies that track your blood temperature and breathing rate. If you are ready to live a more active lifestyle without the constant worry of an irregular heartbeat, call (941) 747-8789 to make an appointment at Cardiovascular Solutions Institute. Dr. Gino Sedillo, M.D. will fit you with a pacemaker that can last up to 15 years before needing to be replaced. With regular checkups and smart lifestyle habits, you can improve your heart health and give yourself the gift of a normal life.